I was recently listening to Seth Godin give a talk at Google where he said that the internet is the first medium that wasn’t invented specifically to carry ads (unlike magazines and television). So to become successful as a company, Google had to figure out a way to make ads just as useful as their search results and that’s exactly what they did with AdWords. After some 10 years where the look and feel of the ads didn’t change much, now Google has started offering all sorts of ways to make the ads more interesting through ad extensions. Ad extensions are a way for advertisers to enhance their text ads with additional information that the user might find interesting like a location, a phone number or additional links to a website. Because extensions make ads bigger, they draw more attention and because they make the ads more specific, the people who click are better prequalified. And just as with AdWords in general, creating an extension is free and you only pay for clicks. 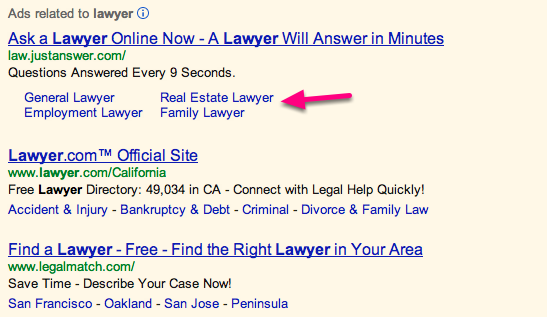 The sitelinks extension is great if you’re trying to promote multiple parts of your business through a single ad. 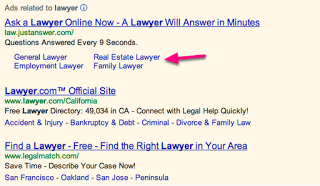 You can add up to 10 extra links in addition to the main destination URL of the ad. This helps you tell potential customers about the different products or services you provide and lets them go to the section of your website that talks about those specific things. When a customer lands on a page that is exactly what they were looking for, chances are better they will convert. 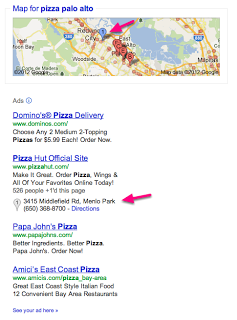 The location extension adds your business address to the ad and also shows it with a blue pin on the map. 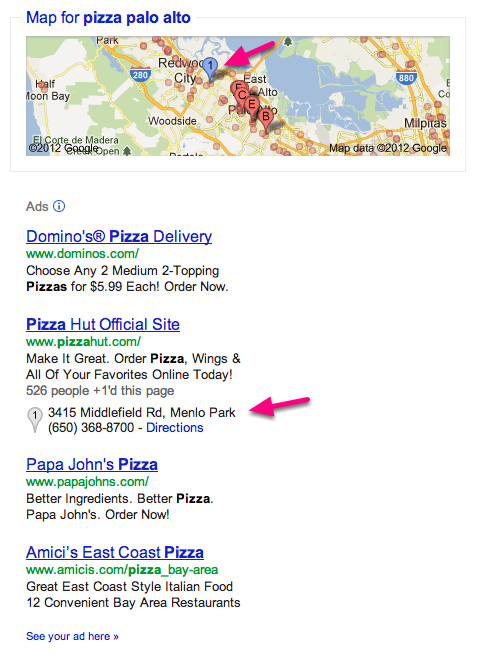 You can manually add your address but I recommend adding it automatically from your Google Local page. The Google Local page is a one-page website for your business that’s hosted by Google and that is shown to people who use Google Maps to search for a business. It’s free to set up and it’s a good way to give potential customers another way to find you. Some businesses would rather get a phone call than a visitor to their site and that’s what call extensions enable. Rather than using valuable space in your ad text to put in a 10 digit phone number, you can now use the ad text to tell people a good reason to call you, and then the number appears below the ad. If your business is local, showing a phone number on a mobile device is a no-brainer… it lets potential customers call you when they’re ready to walk into your business. Rather than getting a lead through your website, a phone call lets you connect with that prospect in real time. To read more about setting up a campaign with these extensions, check out my step–by–step guide to setting up AdWords. Frederick (“Fred”) Vallaeys got involved in online marketing in 1998 when he ran search ads out of his dorm room at Stanford selling VHS cassettes of popular movies. After graduating in 2000, he joined a tech company that went under in the dot-com bust and to make ends meet, he became the Bay Area’s first digital wedding photographer. While placing ads for his small business, he noticed a small search engine company called Google that had some innovative ideas in the online ad space, and he joined in 2002. At Google he helped grow the AdWords search marketing system and served as Google’s AdWords Evangelist, teaching advertisers about which Google products are best to support their marketing goals. In 2012 he left Google to start his own business, Top Tier, because he saw an opportunity to make online marketing more accessible to small businesses through education, tools and services. He speaks at numerous events, including the annual ASBDC conference, helping businesses get their business online and grow it through online marketing and online tools.